JACK AND THE BEANSTALK™ one of the most successful fairy-tale slot! 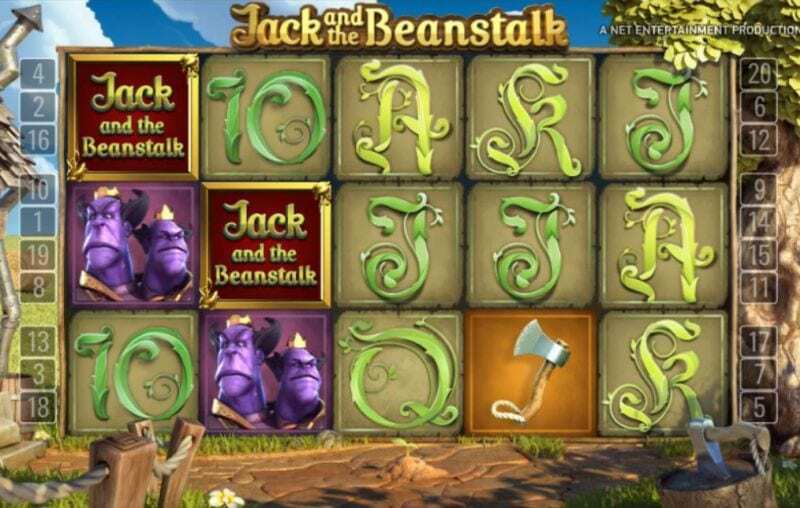 Jack and the Beanstalk™ a great slot for a fantastic fairy-tale ! This Netent online video slot is really like no other. With its fairy-tale theme, it is perfect for all those who are nostalgic of their childhood bedtime stories. Get ready to embark on an enchanting journey in the clouds alongside Jack. Jack and the beanstalk™ stands out from the lot as the slot provider brings innovation on the reels once again. In order to really set the context, the slot machine features a short introductory movie which takes you high into the cloud where the giants’ castle lies. Watch as Jack comes running out of the magical fort, clutching against his breast the precious hen which lays golden eggs, followed close by the two headed purple giant. As he glides down the beanstalk, you suddenly find yourself in his backyard, with in the background the sound of chirping birds which draws you into the story even more. The exceptional graphics of this 3D slot make it real eye-candy for those who enjoy sophisticated games. Netent has really put in a lot of effort in this slot, and it shows. Every detail has been given attention in order for Jack and the beanstalk™ to offer the best gaming experience possible – with a chance to hit a SUPER MEGA WIN of £300,000 ! The symbols take the shape of characters and objects which play an important part in the story, and amongst them exciting treasure symbols that can be unlocked by collecting keys during the game. 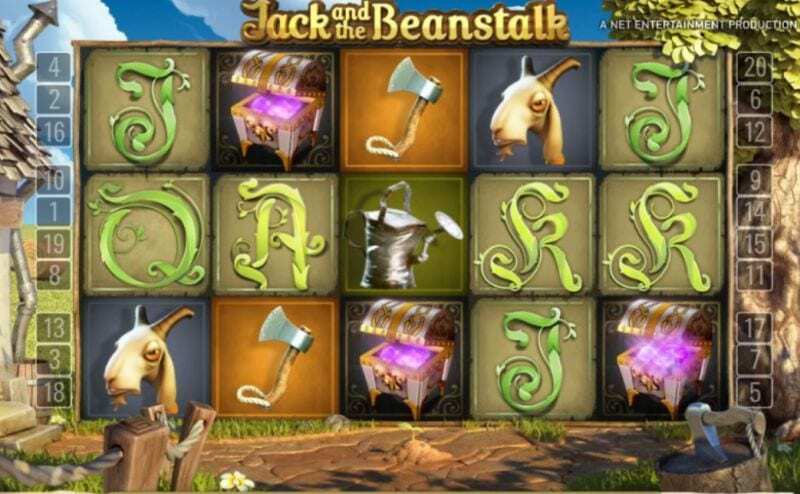 Jack and the beanstalk slot is a 5-reel, 3-row slot with 20 fixed lines and 10 bet levels. Out of the impressive total RTP of the game, 71.5% of it is obtained during the main game, thanks to these 20 lines. Aside from some classic low paying symbols (A, J, Q, K and 10) which are nonetheless shaped out of beanstalk leaves, all the symbols are straight out of the magical universe of the fairy tale. The highest paying symbol is that of Jack – for 5 of these symbols, one may win a 1000 coin big win. Another high value symbol is that of the giant, which pays 750 coins for 5 symbols on an active bet line, as shown in the Netent paytable. Amongst the lower value symbols, we also find an axe, a goat and a watering can. When you hit a win, the winning symbols illuminate and some even animate. The Netent video slot machine also features scatter symbols, represented by a chest full of lilac glittering gems. On top of that, the luckiest players may land the walking wild featured in this slot, which reads “Jack and the beanstalk” in bright gold letters. When it appears, a re-spin will be triggered and it will move to the left by one reel, meaning it can land you up to 5 re-spins! When it activates, the chirping birds are interrupted by a bewitching tune full of excitement. All the wild symbols have a 3x multiplier attached to them. The most thrilling part of Jack and the beanstalk™ is definitely the free spin feature. You can trigger 10 free spins by landing 3 or more chest symbols. 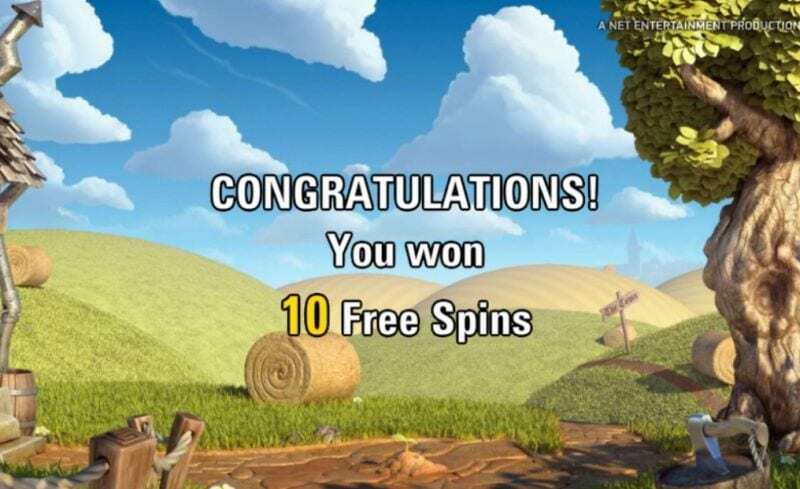 If you are lucky enough to land 3 or more additional chest symbols during one of your free spins, 5 extra free spins will be triggered. In the free spin feature, you will be presented with the chance of winning exciting treasure collection of wilds. In order to obtain these symbols, you must first collect 3 key symbols which are only found on the 5th reel during the free spins. Once you have landed 3 of these keys, a new wild represented by a money bag will make its appearance. This specific wild may also come as a stacked wild symbol of 2 money bag symbols. If you happen to collect 6 of these keys, you will be awarded the golden egg laying chicken wild, which may also become a stacked wild of 3 symbols. However, the wild everyone is after is that which represents a golden harp. To unlock it, one must land 9 keys. The special thing about this wild symbol is that it can expand on the reels, thus dramatically increasing the chances of winning. do not pay anything, however they activate a re-spin. All wild symbols may be used as a substitute for any other symbol, aside from the key and the scatter symbol. When a free spins is triggered, the beanstalk emerges from the ground, carrying both the gambler and Jack high into the clouds by the castle. During the free spins, the young boy stands on the left corner of the slot, encouraging the player as he makes win after win. He even jumps for joy when it’s a big win! The hit frequency of the online video slot is of 34.4% during the main game, and of 33.9% in the free spins. In Jack and the beanstalk™, follow Jack in his quest to uncover the hidden treasures of the giants’ castle perched high in the clouds. This online video slot offers a real return to childhood to all those who wish to add a little magic to their day to day life. With its breathtaking graphics and its interesting features, this game is sure to seduce many casual gamblers. Like all Netent games, this slot is compatible with all mobile devices including tablets, mobiles and laptops. In this high volatility game, the minimum bet is of 20p however for a chance to hit a mega win of £100,000 during the main game and £300,000 during the wild respins, it is best to play with the maximum bet of £100. It features a remarkable total RTP of 96.3%, 24.8% of which may be obtained during the free spins. Netent has paid great attention to the animations, but also to the features, in order to offer a unique experience to all casual gamblers who fondly look back to the stories told to them during their young years.